Lakeland Bank was initially known as Lakeland State Bank before it changed its name to Lakeland Bank in 1997. The bank was established in 1969 and has its headquarter in Oak Ridge, New Jersey. Federal Reserve Banks use routing numbers to process Fedwire funds transfers. Routing numbers are 9 digits used in the United States to uniquely identify each financial institution. To receive fund transfers from other financial institutions into Lakeland Bank account, you must provide routing number. Lakeland Bank’s routing number is 021205376. The routing number can be found on your check. 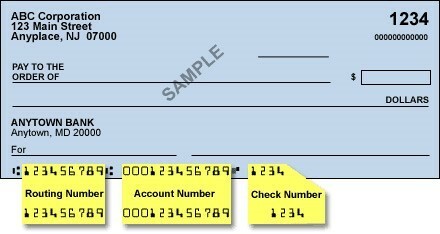 The following sample check image shows where the routing number can be found at the bottom of your check. Whether you are transferring funds across town or across the ocean, you can rely on Lakeland to get it there fast! You can initiate both domestic and international wire transfers conveniently and securely from any computer. SWIFT Code is required if you need to receive international wire transfer into your Lakeland bank account. For the wire transfer to start, you are required to provide the sending financial institution with your bank account details. Since Lakeland Bank doesn’t have a swift code to allow international wire transfers directly into its account, the sending international financial institution needs a correspondent bank in the US to wire the funds to before transferring the funds it to Lakeland Bank using Lakeland’s routing number. Lakeland Bank’s International and Domestic Wire Transfers attract different fees depending on whether the transfers are incoming or outgoing. International Wire Transfers – $15 for each incoming transaction and $50 for each outgoing transaction. Domestic Wire Transfers – $15 for each incoming transaction and $25 for each outgoing transaction.